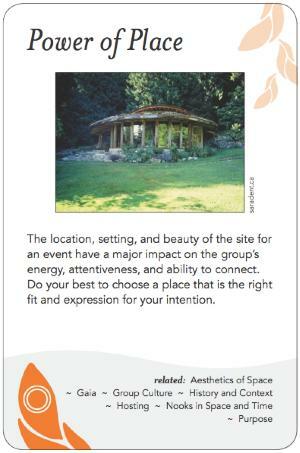 The location, setting, and beauty of the site for an event have a major impact on the group's energy, attentiveness, and ability to connect. Do your best to choose a place that is the right fit and expression for your intention. For many people, the power of "place" is a crucial determinant in what is possible in the nature of group process. It is part of the Invitation, can provide essential beauty, and is a key element in creating a container. The land where a group meets is an active participant in the event, shaping what happens there. There are a few levels to this. First, if it is a national or international gathering, what overall location or region will you choose to meet in? What town within that region? What specific building or event site, and what room or rooms will you use? What does your choice say to participants? What are the travel arrangements to get there, and is it a convenient location for non-car-owners or people coming from a great distance? Depending on the scale of your event, other issues may arise, such as access to affordable and diverse meal options. What's the setting? A natural setting provides pleasant views and a rejuvenating alternative to being inside. Rural settings can foster a greater sense of connection to our natural selves, greater sense of intimacy, community, healing, sanctuary or retreat. Different landscapes (ocean, desert, forest, sky) can also be evocative, influencing the mood, energy and relaxation of the group. Urban settings may evoke a more intellectual energy, but can also be distracting and allow participants a greater opportunity to disengage during the event. What is the space good for, and what will it foster? Does it have enough and the right kind of spaces for your particular event? Is the space appropriate to planned (or possible) activities, such as a dance floor or surfaces for making art? Consider the color or shape of the room you choose, the amount/quality of light in the space, or a pleasing spatial layout. Roominess (high ceilings etc.) can engender more 'spacious' and generous thinking. Are the chairs comfortable for long periods of sitting? Soft rugs or carpeting might allow participants to sit on the floor if they choose to. Well-designed, beautiful architecture can stimulate creativity and appreciation. Other practicalities: What's your budget? If you will be preparing food, is there a kitchen you can use? Are there plenty of bathrooms? Will there be construction, other groups, or other potential distractions going on during your event? The aesthetics of the place chosen need to be appropriate to the occasion -- not overwhelming, distracting, or dissonant to the purpose of the event (e.g. lush opulent surroundings for a meeting on urban poverty, overly loud music nearby, etc). Some people have a fear of nature, open or closed spaces, loud noises, or the dark.